Car enthusiasts and music enthusiasts alike will find these speakers to be extremely tantalizing. The Polk Audio DB series is all about producing high-quality sound with a shear, shiny, sophisticated look. Whether you want to hide the speakers behind the original sound grills of the car or show them off in all their glory, the Poly Audio DB series offers quality speakers that will satisfy any needs. The Polk Audio DB651 6.5-Inch Coaxial Speakers are by far the best speakers in their DB class, but arguably also some of the best 6.5″ car speakers currently on the market. What special features causes these speakers to stand out against others of its kind? First, they are adaptable to a variety of shapes and car models. 6.5-inch diameters are large enough for common Japanese models and adapter rings that come with the speakers help them fit into bigger spaces in common European models. The speakers also are marine rated, which means they are durable enough to be installed on a boat that meets harsh waters. Here are some of the many pros of these headphones, organized by category. What about the sound quality of these speakers makes them stand out against competitors? They work well with original sound units and they are often the only item you need to enhance your vehicle sound system. They have excellent sound balance, which is important for a pair of coaxial speakers to produce. These speakers are also said to be very efficiently designed. They need less power to produce higher quality sound and better volume. Therefore, your car battery will not have to work as hard to turn up the beat. This is better for speakers since they are not a primary car part and therefore do not need to be placing stress on the car battery, which is one of the most expensive parts of any vehicle. It is especially important that vehicle speakers fit into a wide variety of car models. It would be disappointing to purchase car speakers that sound great but are not adaptable to your vehicle. The 6.5-inch diameter of these speakers fit well in Japanese vehicles like Nissans and Toyotas. The speakers will also fit into other sound systems via a 6.75 –inch diameter ring that comes with the speakers in order to fit into European-made vehicles. If the size is correct, the speakers are very simple to install and are often the only extra components needed in order to revamp the current sound system. They is much more simple that replacing every component one at a time. The DB651 speakers are also built to be extremely durable. The speakers are made from materials that are hard, but also extremely light. The package of two speakers for shipping from Amazon is only about 5 pounds. The speakers are decorated with hard plastic exterior parts in order to make them look more assertive and better quality so that you can impress your friends with their fierceness. They can then, presumably, be installed in a boat that sometimes needs to take on rough waters. While these speakers are primarily for cars, the marine rating attests to the durability and total lifetime of the speakers. If you are serious about your speakers, then you will love the appearance of these speakers. Perfectly round, they already look better than some speaker models that are more oblong. Polk Audio takes pride in producing equipment that looks fresh and fierce. These speakers look serious and intense, with dark, hard plastic covers on the grill that give a professional vibe to the sound system. Not only do the speakers sound great, they also look great. Here are some cons to investing in these speakers that you should consider before purchasing them. It is important to note that Polk Audio only claims that these speakers can maintain a maximum of 60 RMS watts, not 180 as some people are led to believe. That being said, the bass does not have as full a range as more expensive speakers in relative classes, but the speakers work well with the power that they do have to deliver clear, pristine sound that is easy to understand. The speakers, unfortunately, cannot be adjusted to fit into smaller holes. They can only fit into spaces that are 6.5-inch diameter or larger due to the inherent nature of the object. While some people will really enjoy the intense look and fashion of these speakers, the look may come off as too intense to some individuals, who would rather have great sounds coming from hidden sources. These speakers are therefore, a little more flashy than one normally expects from car speakers. Investing in new car speakers is sometimes a long road. Modifying your vehicle in any way can be a painful and difficult process, but when you finally find the right products that fit in your vehicle and provide great service, installation difficulties are worth it. One of the best ways to improve your sound system is to invest in these high-quality speakers, perhaps the best 6.5-inch speakers currently on the market. While they do not provide the widest range of sound, they do not claim that they can. 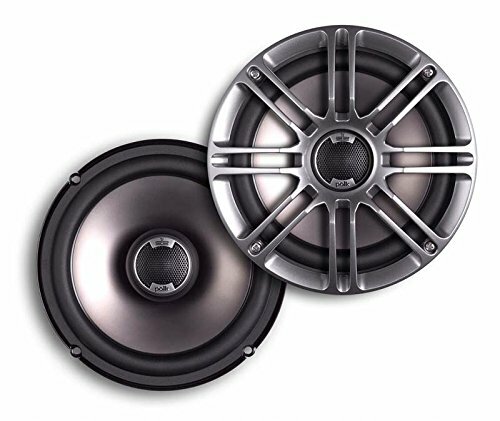 They are excellent speakers for their value, and would serve as a very welcome and complementary addition to your current vehicle sound system.